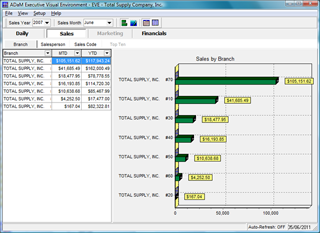 The Executive Visual Environment (EVE) is an Executive Information System (EIS) designed to provide important information at a glance with a heavy emphasis on the visual representation. Segmented into user defined visuals, see at a glance: daily bookings, shipments, backlog, AR, AP and more. 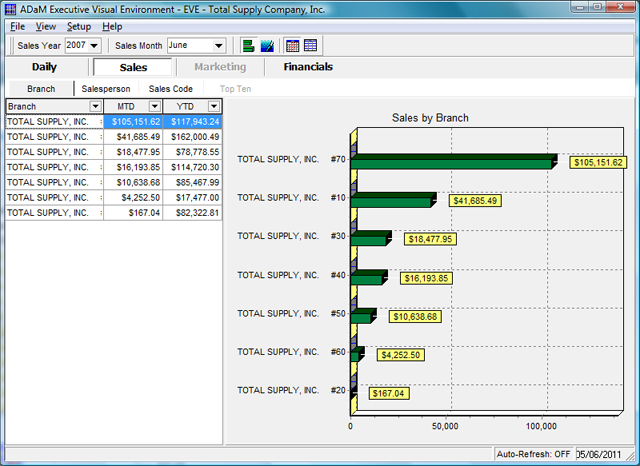 Monitor branch operation from your office, while on vacation or at home. You can even watch your daily order totals taken in real time! Mobile order entry with customer look up. Inventory look up with pricing information. Synchronization options to create orders to the warehouse. Easy look up and edit capabilities. User selection on what files are updated on the mobile pc. e-mail: info@absonline.com Copyright © 2001-2019 Advanced Business Software Inc.